I have been in Rio de Janeiro for two days now and have for the past two weeks made a serious effort to prepare my portuguese as much as possible. I have previously made a very poor effort at learning portuguese while travelling in Portugal with a friend from Norway. I didn’t really know how to learn another language, and was barely playing around with the language. Now, 3 years later, I am armed with the power of internet and the countless resources that people have created to help people learn languages. My motivation is also a totally different story now. Here I will try to outline which approach I have taken, which resources I am using, and the purpose of the different resources. First of all my method is based around my motivation and efficiency. I must try to find a way to connect the writing with the sounds and also have a way to look up the words quickly to learn as much as possible in a short amount of time. There is a lot of opinons on how to learn languages. But as long as you are motivated you are going to succed. So I try to use methods that I find enjoyable so that I will continue to stay motivated. I am a huge fan of free or cheap educational resources, so I have mainly used free resources for learning portuguese. Language learning does not have to cost tons of money with tutoring or classes, but it requires rock solid motivation and discipline. My Spanish level was somewhat decent before I started with Portuguese so I had a great advantage already from the beginning. However it can be bit confusing since they are really similar, but with good practice that obstacle can be overcome. In my opinion Pimsleur is the best audio course that you can begin with. It is focused on conversational speech so you quickly learn to have a conversation, and that will get you really motivated. It repeats the phrases in a intelligent pattern so that you have a high chance of remembering different phrases. So put it on your phone when you go to work 😉 Check it out! First of all, I have turned my computer as much into portuguese as possible. Facebook,, Chrome, Google, Wikipedia, Youtube, Windows, LibreOffice, it’s all in portuguese at the moment. It’s a bit frustrating in the beginning, but you will get used to it quickly. This is a great site to get a quick start and get activate with the language. You practice listening, writing and reading (it does not support Portuguese voice recognition at the moment) in a easy, free and rewarding environment! However, I only like this page to get started as the sentences that you practice are not very conversational at all and sometimes really weird. You do learn the grammer and sentence structure quite well, however I want to learn that while learning useful phrases. I also use the translating feature of the website as well, but I haven’t found so many topics that interest me that I have invested much time in it. This is a newcomer on the language learning scene that is in the same ballpark as Duolingo, however it takes a more conversational approach. I really enjoyed this site to get started as well, and it focused on certain pronounciation aspects that is unique to this site. 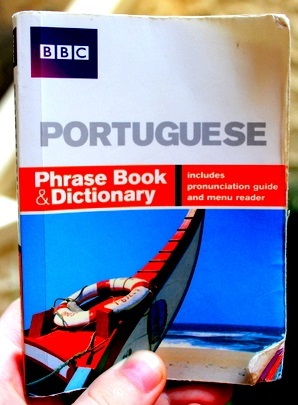 It features a decent voice recognition for portuguese which forces you to say the phrases and words out loud. This is a paid service, but very cheap. This site is for writing short posts, and people can suggest corrections for you. This is extremely helpful to get quick feedback on what you need to work on to improve your writing (if that is your focus). There is a lot of native portuguese speakers on the site so you will get feedback quite quickly. A huge part of language learning for me is to use the dead moments during the day. When you are on long bus rides, standing in line, walking outside, doing dishes or whatever, I often have an ipod which I can listen to. Orlando Kelm at University of Texas at Austin and his team has created an fantastic resource consisting of recording of natives talking naturally, so you have the opportunity to get busy listening to how real portuguese sounds like. Check out the websites BrazilPod, but especially Portuguese Communication Exercises and Conversa Brasileira. These podcasts can downloaded through links on the site and iTunes. This is an amazing site with a lot of traffic. I use it mainly as a chatting service, but you can also talk to people there as well (with actually using your voice). Why do I like to get starting out with chatting with other people? Mainly because I manage to remember words better when I know how they are written. So then it is great to use a chatting service to write out several common frases and also get practicing reading frases back. You also get a quick feel for what kind of frases are normal to use in portuguese. I learned from Fluent in 3 Months blog that all you need to get started is a phrasebook. 😉 After that I often try to get hold of either Colloquial series or Teach Yourself, which I find quite enjoyable since they have a conversational approach. I have tried several different dictionaries on the net, but no one really stood out. Now I stick with an android app, and Google Translate. I use this Verb Conjugator. Try to use your friends for whatever they are worth. How to find portuguese speaking friends? If you are willing to find people on internet there is a lot of sites that will help you. My favourites are SharedTalk and Lang-8. But there is also italki, babbel, livemocha, and verbling. I really like to use videos for learning languages and Youtube is packed with portuguese videos. I found many video lessons on Brazilian history which where texted, which was a goldmine for a language learner like me. Check out Ensino fundamental – História. This is my primary starting point when learning about anything, and turning this into portuguese helps a lot. What about this article about the explorer Vasco da Gama? Amazon have released several free portuguese books, so you can download them and read them on whatever Kindle device you have. They are quite old, but I found this book written by the Portuguese explorer Alexandre de Serpa Pinto called “Como eu atravessei África“. Although learning languages from movies can be done with some success, I mainly like movies to get to know more of the culture part of the language. I always put subtitles in the target language, and often pause the movie to look up the words so the movies end up lasting for a long time. Brasilian movies tend to be quite violent, but there have been made some really inspiring movies in the last few years. Here is my favorite brasilian movies: Xingu, Dois filhos de fransisco, Lula – O filho do Brasil, Heleno. Parabéns Ivar. Acabei de enviar um recado no facebook para vc. Dá uma olhada lá, qualquer duvida é só perguntar.